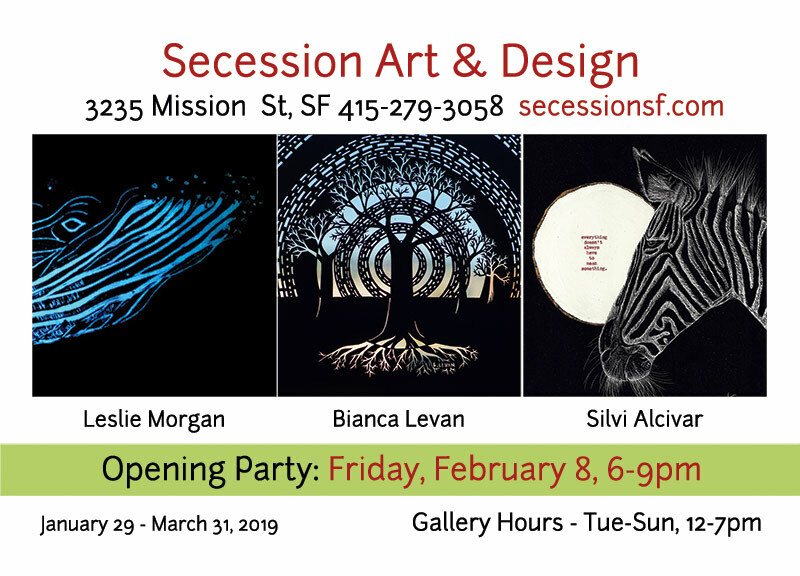 Secession Art & Design is honored to host Into Light, our new show featuring Silvi Alcivar, Bianca Levan, and Leslie Morgan, three women using experimental mediums to explore themes of life, the unexpected, and nature. Silvi is revisiting scratchboard, a material from her youth that allows her to scratch away from a dark surface revealing the white negative. Bianca hand-cuts her art from a black piece of paper, transforming patience and thought into an intricate scene. Leslie creates monoprints of sea creatures that, when the lights turn out, glow in the dark. Each of these women approaches their work as a meditative experience to reveal beauty out of nothing.